DOCTOR WHO: Behind The Sofa - PYRAMIDS OF MARS | Warped Factor - Words in the Key of Geek. Andrew Jero continues his look back at some of the Doctor Who stories that as a child saw him, and countless other children, watching from the comfort of behind the sofa. I remember the very first time I saw this story, at first it just seemed really cool. Some Egyptian dude with a bunch of ancient artifacts in his house, but it’s the cliffhanger to episode one that starts the rapid build up of horror. 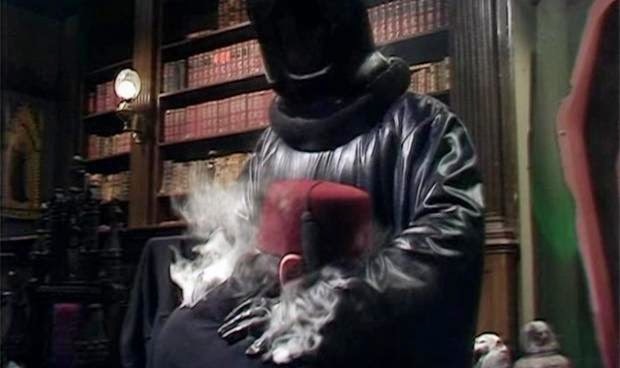 Professor Scarman appears in the house through the sarcophagus and kills Namin, “I am the servant of Sutekh, he needs no others.” From that moment on the story becomes one of the scariest things I’ve ever seen! The music is one of the greatest elements of the story, if you own the DVD take a listen to the isolated score it’s very good! Part two is perhaps the creepiest with mummies walking around dragging cadavers around the mansion and the end where the two servos crush the poacher adds to the atmosphere. 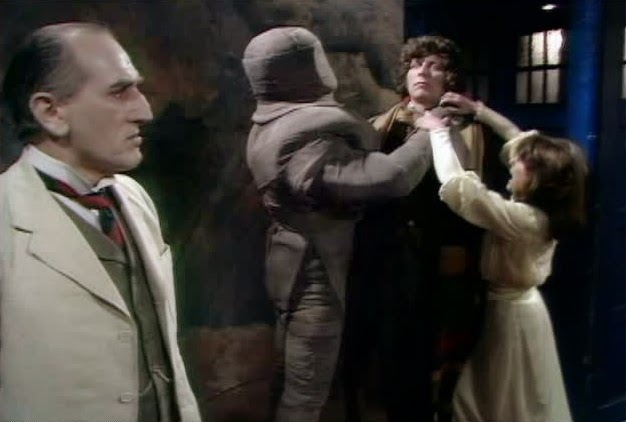 One of the most chilling moments is when the Doctor takes Sarah and Lawrence to 1980 and see that it is a desolate wasteland, finally giving us a glimpse of Sutekh’s power, something which is a major element of the horror throughout the story. The prospect of a being with that much power that it took 740 Gods to simply imprison it really brings some gravitas to the events played out on screen. Tom Baker gives one of his best performances, he consistently plays the Doctor with a very serious attitude and gives us one of my favorite moments right after Lawrence has been killed. 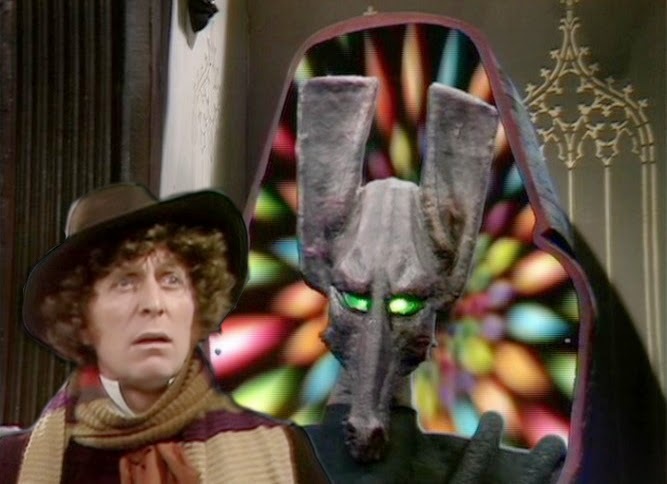 We get to see that with such power as Sutekh has while he is trapped in Eygpt, the Doctor has no choice but to glaze over the deaths of the few people who die in this story when compared to the billions that would die if Sutekh gets out. That realism brings a strong sense of horror to the story, and things always become scarier the more realistic they seem. The times that television and movies are made and viewed certainly can have an impact on the viewing experience. Now, watching a show featuring an alien with supreme power who seems to be unstoppable may not be all that realistic, but add to that that when I first watched this story September 11th 2001 was in the very recent past, and at the age of five anything that seemed to have that much destructive power was truly frightening. Pyramids of Mars is nearly perfect, but kind of lacks in the middle of part four with the fun and games of the Osirins. Everything else in the story works perfectly, from the really creepy, bone chilling, organ music to the power of Sutekh. While not nearly as creepy as State of Decay, Pyramids of Mars certainly scares children enough that they may feel the need to hide behind the sofa, as was often the norm for the Phillip Hinchcliffe era of Doctor Who. Which Doctor Who stories sent you 'behind the sofa'?